Designers cater to kids’ wide-ranging tastes in the form of whimsical animal motifs, glitter galore, empowering messages and mini-me sophistication. 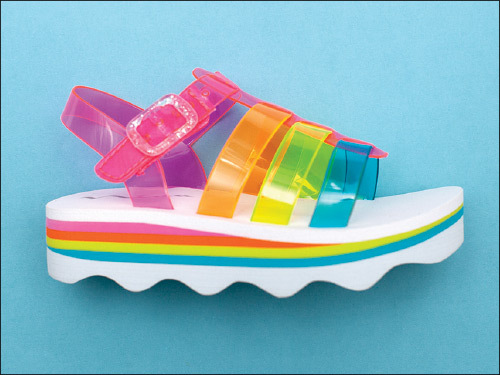 With most parents today having grown up in the ’90s, the children’s market is meeting a growing demand for nostalgic buys like jelly sandals, pool slides and chunky sneakers. The sporty silhouettes feature plenty of neon color pops in tune with the ’90s revival theme. 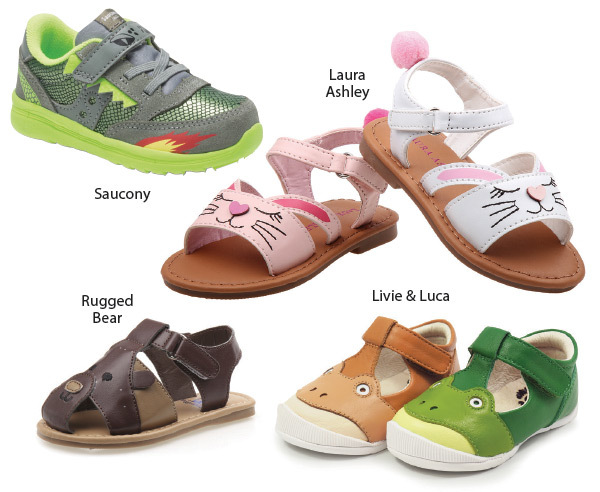 “We’re taking recognizable silhouettes and giving them a contemporary facelift,” says Heather Dady, designer for Western Chief Kids, citing new glitter-infused jelly sandals as an anticipated bestseller. Bil Waring, senior footwear buyer for Joules, agrees the ’90s are back. 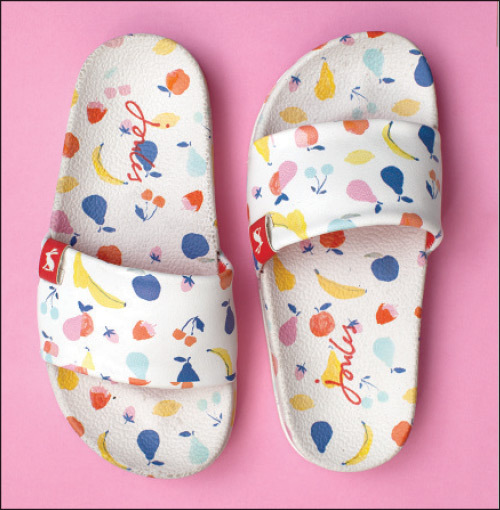 “Pool slides have grown massively and are overtaking the classic flip-flop silhouette,” he says, noting that slides have been added to Joules’ collection for children. Classic label Laura Ashley is even experimenting with retro-inspired clear materials like PVC for a revamped look to its classic designs. “While it may be as simple as the color of a flower petal, we always find a way to integrate Laura Ashley’s iconic prints with current trends,” says Penne Cairoli, president of Laura Ashley’s U.S. division. Kids today are dialed in 24-7. Many are fixated on their phones—sending and receiving Snapchats, checking their Instagram feeds and watching their favorite YouTubers. Their ability to communicate with each other instantly and constantly means trends can spread at a viral speed. Collectively, kids are becoming as influential as the influencers so many of them follow. Never before have they held so much power in determining which trends live and die. “Kids are the ones making the rules,” Dady says. “They’re listening to other kids and inspiring them to do more of whatever they love.” With that, brands are listening and following closely. “We look at what kids are doing everywhere we can,” says Luis Gonzalez Palacio, director of design for Vida Kids. “It’s important to draw inspiration from less obvious sources,” he adds, noting kids’ reactions to music, art, food and travel are key ways to determine what trends will sell. Bornie Del Priore, vice president and general manager of Wolverine Worldwide’s kids’ division, agrees, stressing the importance of looking at more than adult trends to find out what’s going to be hot. “We go straight to the source, asking kids what they like and don’t like in addition to keeping an eye on what’s happening in pop culture,” she says. For Spring ’19, Del Priore affirms self-expression as one of Wolverine’s primary focuses. 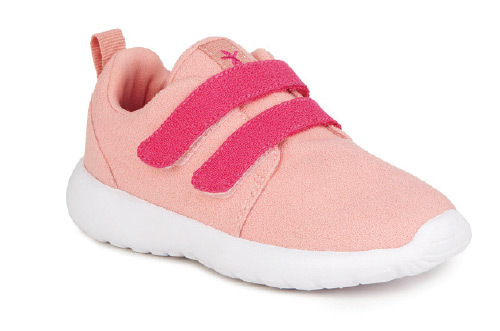 “Whether that’s shoes with words on them or fully customized designs, kids want to feel like they are wearing a part of their personality on their feet,” she says. Keds, for instance, is launching a collection that features empowering messages for young girls that swap conventional “I am a Princess” themes for contemporary “Girl Power” messaging. Dady has also kept a gender-neutral presentation more in mind when designing Western Chief’s latest collection. 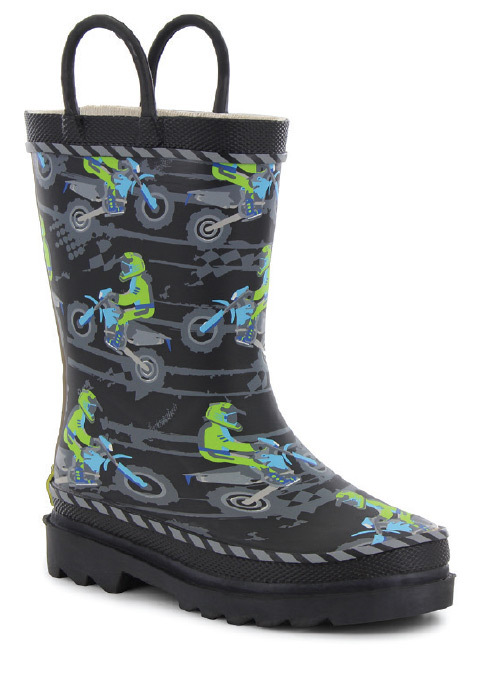 “Sometimes we mix up what is considered a boys’ boot and put it on a girl model,” she says, noting that the brand’s current catalog features a girl wearing a dinosaur boot. For next spring, Dady expects motocross to have a big moment with racecars, checked flags and roadway graphics in abundance. “We took a chance throwing it in there, and it’s really taken off,” she says, noting most orders are probably geared toward boys, but the company expects plenty of girls will be customers as well. Chalk this trend up to the Allbirds effect. The New Zealand start-up wool sneaker company has taken Silicon Valley techies by storm and been a darling of The New York Times coverage. In response, a flock of wool wannabes have landed on the market, be it sneakers, slides, clogs, slip-on or booties. Apparently, wool has never “felt” so good. 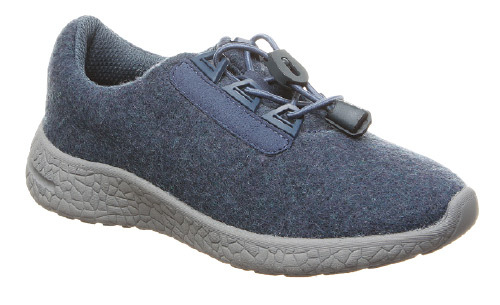 “The wool sneaker is the hottest trend of late,” confirms Keith Barnett, North American sales manager at EMU Australia, noting lightweight washable wool sneakers is a key item of its Spring ’19 collection. Beyond being trend-right, Barnett says the all-natural material is able to regulate internal temperatures as well as remain insulated even when wet. In addition, wool has natural moisture-wicking properties and antimicrobial tendencies. Bearpaw’s LeMons agrees wool is one of the season’s trendiest materials, mentioning wool oxfords as a popular style for boys. She expects fur in general to become more common outside its standard winter season. “As temperatures vary a lot in the spring, fur provides that warm-but-still-breathable benefit,” she says. “Fur, particularly faux fur, is something we’re going to see a lot more of as a style statement,” she adds. 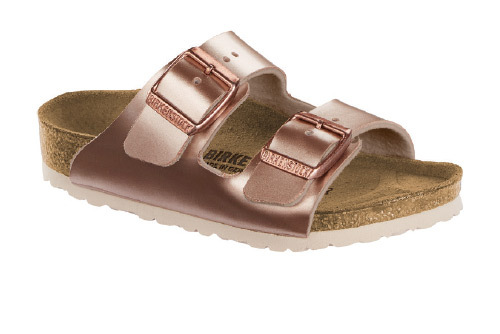 Jacqueline Van Dine, vice president of merchandising for Birkenstock USA, says the company will take down a few best-selling sandal styles, including the Arizona and Gizeh in metallic copper and Mayari in mocha and silver. “We’re noticing an increasing number of our littlest customers wanting to look like older siblings and even parents,” she says. It’s a win-win scenario, she says. “Parents know firsthand the quality, flexibility and all-day comfort Birkenstock provides and feel confident in purchasing mini-me styles for their kids,” Van Dine says. Stephanie Keyser, senior line builder for Dr. Scholl’s, a division of Caleres, anticipates its Original Collection to be a good fit with the takedown trend as well. She expects comfort-driven, slip-on sneakers in neutral to bright hues to be popular. Joules has also expanded its mini-me selection with coordinating slides for women and kids with signature colorways and floral details. Three-dimensional animals are popping up across boys’ and girls’ silhouettes. The Keds for Kate Spade New York collection, for example, will launch a slip-on style this spring featuring an adorable cat face on the toe cap, while Saucony is introducing new critters to its Baby Jazz Lite collection, including mythical creatures like mermaids and dragons. Dinosaurs also roam the landscape. 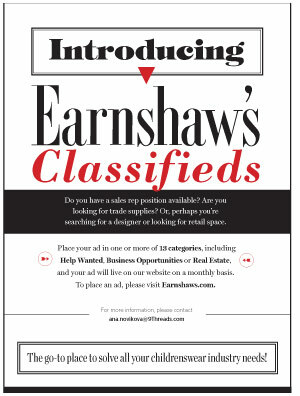 Laura Ashley’s Cairoli says fresh faces for its spring collection span kittens, puppies and bunnies. For Vida Kids, animal motifs have always been a consistent bestseller, and next season expects to be no different. Brands predict dinosaurs, dragons and safari wildlife to be popular in boys’, while llamas, cats and unicorns take preference in girls’. First came the unicorn craze—images of the mystical creature galloping across clothes and accessories. Simple fashion logic dictates that sparkle and shine embellishments would follow. Look for lots of iridescent materials, glossy metallics and gobs of glitter for that “wow” factor. 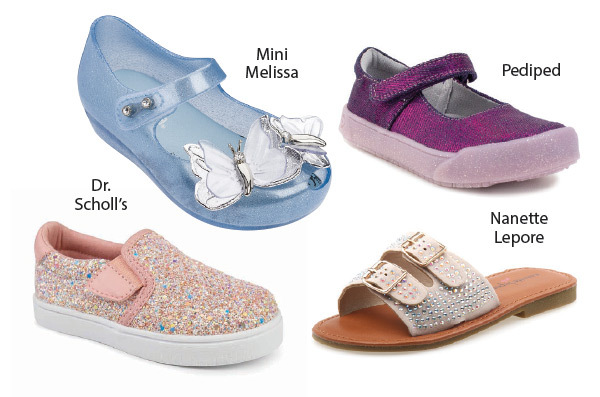 “Light or chunky, glitter is going to be big for Spring ’19,” says Keyser of Dr. Scholl’s. The line incorporates “bright and cheery” colorways, pops of neon, glittery accents, polka dot laces, sporty neoprene and 3-D flower embellishments. “We take what is trending and mix it with what we know kids like, what parents love and what’s sold well in previous seasons,” she says. The glitz blitz can also be traced to the major couture houses embracing the trend during Spring ’18 runway shows. Led by Tom Ford’s sparkling knickers and Marc Jacobs’ sequin-heavy outfits, Fendi, Halpern, Molly Goddard and, of course, Gucci went big on ’70s-era glitz. “As Gucci mania continues to take the industry by storm high ornamentation seems to be the name of the game,” says Beatriz Camacho, retail director for Mini Melissa. Camacho says the jelly-based brand’s spring collection will feature gleaming feminine appeal with whimsical elements like butterflies, flowers, rainbows and, of course, plenty of glitter.